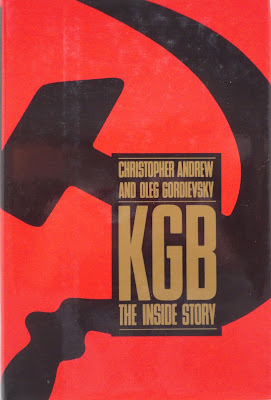 Elaine O'Flynn at the British newspaper the Daily Mail offers a piece on former KGB officer Oleg Gordievsky, co-author of KGB: The Inside Story, and how he was able to defect to the United Kingdom. A Cold War double agent has revealed for the first time how a Mars bar and a dirty nappy helped him escape capture when he fled the USSR in 1985. Thirty years to the month after his daring escape, Oleg Gordievsky has revealed how he managed to flee the Soviet Union with the help of MI6 when he realised his cover was blown. Now 76 and still living in England, the KGB chief spent more than a decade covertly passing insider information to the British authorities, including active operations and the identities and whereabouts of Soviet spies, helping them to learn about the country's tactics during the Cold War. When he was betrayed in 1985 and subsequently interrogated, Gordievsky put into motion an elaborate plan to help him escape Moscow, he told Ben Macintyre of The Times Magazine. 'Operation Pimlico' was triggered if he stood with a Safeway plastic carrier bag at 7.24am on a Tuesday morning by a designated bakery on Kutuzovsky Prospekt in Moscow, where he could be spotted by a MI6 officer. There, he would wait for his next signal - a man, wearing a shirt and carrying a green Harrods bag, who would bite into a Mars bar as he caught Gordievsky's eye.